RIGOL DSO Software Utility w FFT, Level Grade, Float Accuracy Data Storage. 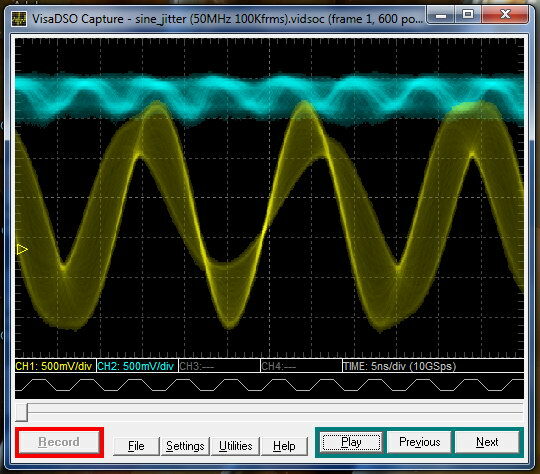 1) import signal from any instrumentations of higher bits (12, 16 bits etc for eg) that can produce CSV output file for higher precision FFT etc analysis. 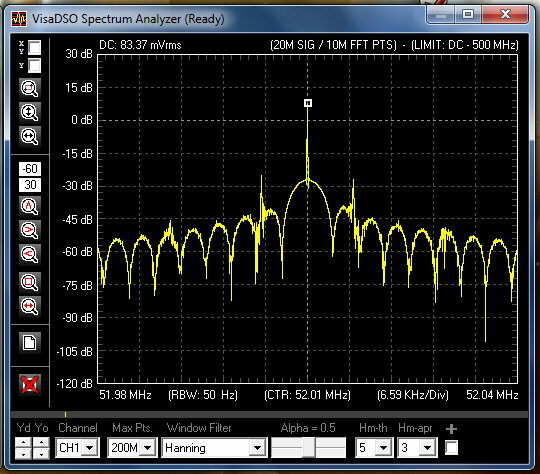 2) deep memory FFT (currently up to 200Kpts for beta testing) but soon 20-200Mpts FFT is just right at the corner. 3) can interactive zoom-in, zoom-out, pan long memory data and deep memory FFT. THD measurement, peak finding, sort, center etc. 4) intensity/color/heat level grading for jitter and eye diagram analysis. Re: RIGOL feat. Higher Bit/Float Accuracy General Purpose Deep. Mem. FFT SW.
Do they know that Rigol still (last I cheeked at least) screw up the CSV data field for capture rate? That will make some strange FFT results. I tried to install (including Nightly Build Patch) and run this - but no luck (Windows 7 x64 SP1). Generates an APPCRASH immediately upon starting. Microsoft seems not to attend to this case though they assure to fully support Visual Basic applications on windows 7. At the moment the only solution is to downgrade the msvbvm60.dll to Version 6.0.98.02 shipped with Windows XP. And doing so, all the problems should be solved. the download link is broken. i check MSVBVM60.DLL's version that came with the VisaDSO installation files (open in *.cab), its the 6.0.98.2 i guess during VisaDSO installation, the Win7 didnt overwrite its original bundled ver 6.0.98.15 with the one that is provided by the installation files. my suggestion is you need to manually force to copy MSVBVM60.DLL ver 6.0.98.2 into your system. edit1: the link is not broken, i just put the wrong link to it (...) its now corrected. edit3: testing with MSVBVM60.DLL ver 6.0.98.15 and 6.0.98.32 will be done soon. Looks really good Mech, I'll try this. David2 was working on similar software to do long record length FFT on the Rigol. This one looks much more advanced. I'm afraid I don't have anything but Win7 computers to test on - none of the later Win versions have seemed worthy of an upgrade hassle to me. Thanks for the response, Shafri, but it didn't fix the problem. please restore the original OS bundled ver 6.0.98.15 as i realized my test Win10 and Win7 here are using the OS bundled ver 6.0.98.15 MSVBVM60.DLL, not from the install files. i'm not sure whats your problem, but i will look into this matter and get back to you when i have solution. thanks and sorry. When I was installing, the Setup never asked me about potentially overwriting a newer version of MSVBVM60.DLL - but it did ask me about overwriting a newer version of (if I remember correctly) the ActiveX control COMDLG32.OCX, to which I declined. I'm not sure if that makes a difference, but my current version is 6.1.97.82, while the one in your CAB file is 6.0.84.18. EDIT: I'll try swapping the control and see if it makes any difference tomorrow morning. Just played around with this a little bit, and ran into an issue with the spectrum analysis: max frequency can only go up to 5 Hz! After some playing around, I found the rootcause: your software does not take into account the regional format settings. In the Belgium regional format settings (see screenshot of my settings on my Win7 pc) the use of dot and comma is different then in the US regional format. This causes stranges results with your application. I found the rootcause: your software does not take into account the regional format settings. In the Belgium regional format settings (see screenshot of my settings on my Win7 pc) the use of dot and comma is different then in the US regional format. This causes stranges results with your application. the comma decimal was thought out and tested at some point in the dev, for eq, you can input comma decimal when changing freq range in textbox (min, max, center, rbw). i will appreciate if you can provide and PM me with the data set (or at least number of points) that produce this misbehaviour, and at what stage (what button pressed) that cause it. in PM or email, thank you. Re: RIGOL DSO Software Utility w FFT, Level Grade, Float Accuracy Data Storage. Thanks for this software, it's really useful (especially for exporting data as CSV it tooks an hour on scope!). There is still bug with regional settings (if your default decimal separator in system is comma it crushes, changing regional settings that it's dot "fix" this problem). I wonder if you could make it possible to select bigger time scale when downloading full memor, for example if i capture long signal with deep memory to zoom in, i can't zoom out it as much as i want (i can't see whole signle data transfer if i record some protocols). Yes i know about that, just 12k point is too few for me, didn't know that it is because of performance. yes. iirc its for playback performance reason. how much points do you need? i find it difficult to process signal at 12Kpts. it is 6pts per pixel of my monitor already. maybe you can reduce your scope's capture rate somewhere at 5 - 10X the protocol rate? so you can see 1200-2400 bits in the visadso screen at one time? ymmv. but maybe i can consider to increase the display point later. middle button click and drag the graph will also slowly scroll the memory left and right to analyze your protocol. In fact i don't really need that many points i just need zoom out (maybe decimate) view. For example when i want capture few packets of digital data with slow transfer rate, i must use big amount of scope memory, because there is a long time of inactivity, and can't use segmented memory (which would be perfect for that) because segmented memory can't be exported to PC. For example here is 3 packets of UART captured in single shot, i can't zoom out to see one whole packet at once. In whole memory 6M, currently displayed 6k (max). Thank you, now it's just perfect (and pretty smoth rendering too, i expcted worse).